His first ability, Earth Spike, is his bread and butter teamfight spell. Earth Spike causes sharp tendrils to burst out from the ground in a straight line, knocking all enemy units in its path into the air, stunning them once they land. They also take a moderate amount of magic damage in the process, softening them up for follow-ups. Landing Earth Spikes on multiple enemy heroes in a large-scale engagement can easily turn the tide of battle in an instant, making this one of the most dangerous spells in the game before heroes are able to obtain items that protect against it. Complementing Earth Spike is Hex, his second ability. 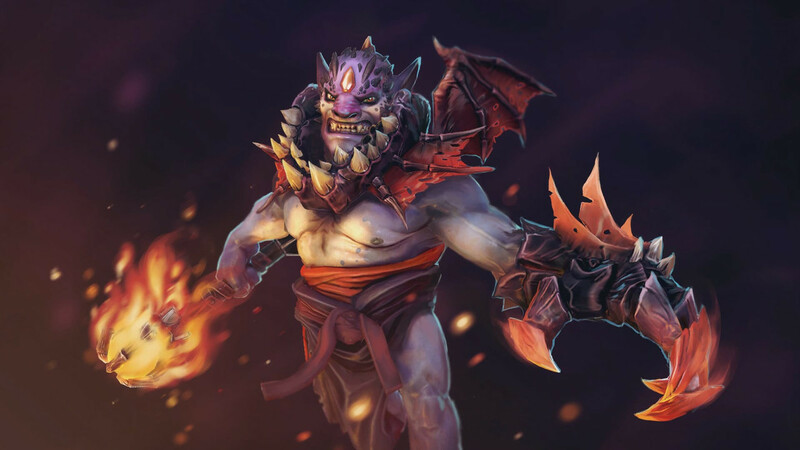 Much like Shadow Shaman’s Hex, Lion’s version transforms a target enemy unit into a harmless critter, disabling their abilities, regular attacks, and items, while also slowing their movement speed to a fixed value. A truly potent hard disable, Hex can shut down pretty much any hero in the game for up to four seconds at a time, rendering them helpless long enough for Lion’s teammates to do some real damage. Rounding out his pre-ultimate skills is Mana Drain, which straight up absorbs an enemy units mana and transfers it to Lion’s own mana pool. In addition, the targeted unit is slowed by up to 32 percent, which means more time spent under the spells effects. It is, however, a channeled ability, which means that Lion performing any other action or getting stunned/disabled causes the spell to end immediately. Regardless, it is still a useful part of Lion’s kit—especially against heroes with small mana pools or those that are really dependent on it. Finger of Death, his ultimate ability, is one of the most iconic single-target nukes in the game. It works exactly the same as Lina’s Laguna Blade, zapping targets for massive amounts of magic damage in the blink of an eye. It can be used to finish off weakened targets, and to bring down an enemy hero’s health to a point low enough for the rest of Lion’s team to help clean up. Finger of Death also gets stronger with each kill Lion gets with it, which adds 50 magic damage to the total every time. With his arsenal of devastating spells, Lion can be placed into almost any draft. After all, every team needs some form of reliable crowd contro, which Lion definitely has in spades. Unfortunately, he does suffer from the usual support hero weaknesses: low health and armor, movement speed, and no built-in mobility whatsoever. His abilities also require a lot of mana, which is somewhat offset by Mana Drain—though cancelling Mana Drain is but a trivial task for certain heroes. Lion’s skill progression is really simple, thanks to his only real viable role: hard support. The mana costs of his abilities also help dictate his build somewhat, particularly with Hex as it costs a whopping 200 mana at Level 4. Earth Spike should be where your first skill point goes to. This is of course to help defend and/or contest Bounty Runes, and to help protect yourself and your teammates from early dive attempts. A single point of Hex comes right after, to serve as an additional disable in particularly sticky situations in the laning phase. Mana Drain then gets a value point after that, with Earth Spike taking priority back at Level 4. From then on, you should focus on maxing out Earth Spike to get its damage output and stun duration up as soon as possible. Mana Drain should be maxed out next, so that you have a good way of keeping yourself topped up on mana through the mid game. Remember that you can steal mana from neutral creeps, ranged lane creeps, and heroes alike—with the first two being far, far less of a risk compared to the third option. If you find yourself in need of a pick-me-up, simply mosey on over to the jungle or the nearest lane with an enemy ranged creep in it, and drain away. Also, keep in mind that Mana Drain instantly kills illusions, which can be useful against heroes that don’t have a way of producing more than a few at a time. Hex takes the last priority for the reason outlined at the start of this section in the guide: it’s simply far too costly of a spell to max out early on. This is to balance just how good it is as a disable in general, but you and your team shouldn’t need more than the five or so seconds of disable when both Level 4 Earth Spike and Level 1 Hex are combined—at least in the early to mid game. Finger of Death, on the other hand, should be taken at every ultimate level, as each one is a power spike on its own that should not be underestimated. Thanks to Mana Drain’s existence, Lion typically does not need to build Intelligence items or those that give him flat increases to his mana pool. Instead, he can focus on purchasing health and mobility items, both of which help him survive and set up kills without having to sacrifice his life to do so. But of course, being a hard support means that it will take Lion some time before he is able to get his hands on such equipment. Until then, we recommend buying cost-effective early game items such as Magic Wand, Tranquil Boots, and of course Observer and Sentry Wards to help your team. Magic Wand also helps him with his mana issues in the laning phase, while also healing him during hectic engagements. Once the mid game rolls around, you’ll want to use the reliable gold you get from gank attempts in order to purchase a Blink Dagger. This item alone elevates Lion’s game to a whole new level, thanks to the threat of blink into instant Hex. Enemy heroes must remain ever vigilant against this combo, which spells certain death for them in case they are caught off guard. In addition, Blink Dagger gives Lion a hard escape mechanism, which helps him avoid giving gold and experience away to the enemy team. From there, situational pickups take center stage, and which ones you should get will depend mostly on the enemy team’s draft. Force Staff is a typical choice for Lion players, since it provides additional stats and mobility to supplement that of Blink Dagger. More importantly, though, it can be used on allies, which can be crucial in clutch situations. Glimmer Cape does pretty much the same thing, though it can be countered by Sentry Wards and Dust of Appearance. Mekansm is another viable option in spite of the active ability’s massive mana cost, as Lion can easily recoup this through Mana Drain. Aether Lens extends your cast range, which can help you disable targets from further away without putting yourself in danger. Urn of Shadows into Spirit Vessel can help with pesky regeneration-reliant enemy heroes like Alchemist or Huskar. Eul’s Scepter of Divinity gives Lion a lot of mana regeneration to work with, as well as some much-needed movement speed and temporary invulnerability. Special mention goes to Aghanim’s Scepter, which turns Finger of Death into an area of effect spell with a drastically reduced cooldown. This can be extremely destructive against teams that tend to group up closely in teamfights, and synergizes well with things like Dark Seer’s Vacuum or Magnus’ Reverse Polarity. If you are able to score multiple kills at once with this, your ultimate receives a huge permanent damage buff as well. Unfortunately, this item is quite expensive, and building into it means that you are less effective at helping your teammates while you do so. Make sure to communicate your intentions of buying Aghanim’s Scepter to your teammates, so that they can give you a bit more farm priority. Lion’s teamfight rotation is really easy to pull off, as all of his abilities are targeted spells. If you have a Blink Dagger on hand, you’ll want to use that to instantly close the distance to the target, then Hex them immediately as soon as you get there. Wait a few seconds to maximize the duration, then hit them with Earth Spike. Follow this up with Finger of Death (not to steal kills, mind you! ), to bring the target down to their knees. Should they survive this ordeal, hit them (or another hero) with Mana Drain to make sure that they can’t get away with their abilities. As with all support heroes, Lion is extremely fragile, and does not like taking large amounts of burst damage to the face. He is also a high-priority target in teamfights, thanks to his strong disables and immense magic damage output. Heroes like Templar Assassin, Nyx Assassin, and Visage can nuke him down in a matter of seconds, removing him from the engagement before he is able to contribute. Heroes that can dispel his negative effects also give him lots of trouble. Slark is perhaps the best example of this, as he can simply purge off both Earth Spike and Hex using the strong dispel mechanic of Dark Pact. There is also little that Lion can do against Pounce and Shadow Dance, other than to try hitting Slark blindly with a ground-targeted Earth Spike. Abaddon can likewise remove stuns and disables from his teammates with Aphotic Shield, thus wasting Lion’s cooldowns. And of course, as a spell-dependent hero, Lion hates going up against heroes that can strip him of his mana or his ability to cast spells in the first place. Anti-Mage can slice away at his mana pool with Mana Break, and reflect every single one of his spells back at him with Counterspell. Mana Void deals catastrophic amounts of damage to him after all his mana is gone, too. Night Stalker, Skywrath Mage, and Silencer can all bar Lion access to his abilities, which renders him a total sitting duck.